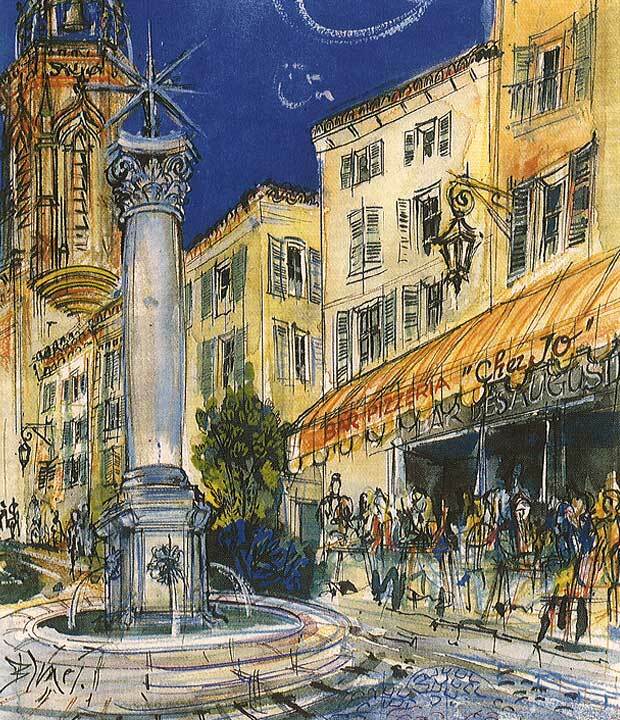 There are so many places to eat in Aix that La Provence reckoned that you could eat at a different restaurant or café every day of the year. Now there’s a challenge! The glossy establishments in town get lots of publicity. But sometimes it’s nice to find somewhere in a quiet backstreet where you can find home-cooking and support new, young enterprises. Restaurants in Aix though have a habit of closing down without warning so do please check them out before travelling specially to these recommendations! Good for: friendly welcome and avocados on sourdough! This café had only been open 9 weeks when I first visited in August 2016 so it was good to revisit it and see how things were going. 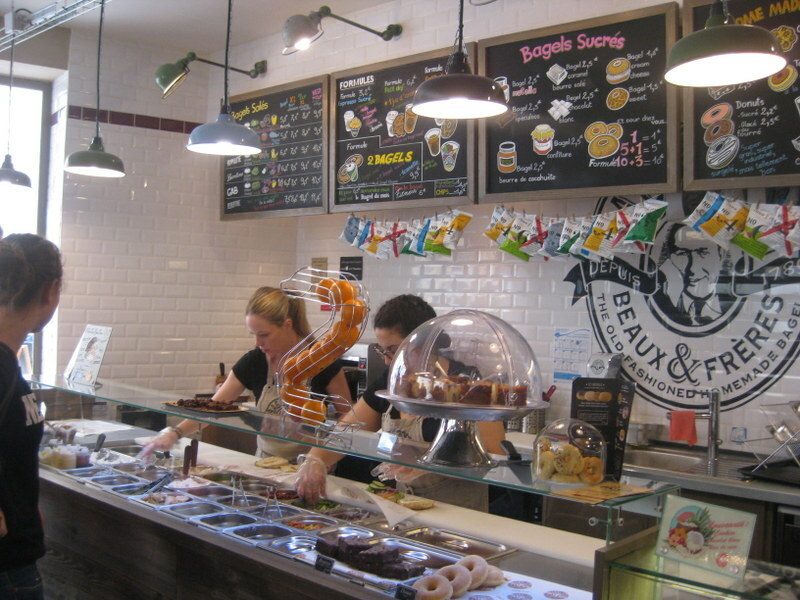 Young British owners Alex and Ben report lots of activity and it was certainly busy yesterday, maybe a result of being rated 2nd best place in Aix for tea and coffee on Tripadvisor, putting les Deux Garcons, at 8th position, firmly in its place. I think it’s ideal for hot drinks in the morning as, unusually for Aix, it has locally-made carrot cake, brownies, banana bread and so on, all the things we Brits enjoy. Then the lunches are deliciously fresh. Soup today was broccoli with cashew nuts, served with salad. And there were tartines with avocado and cream cheese (illustrated) or others with cheddar! The lunchtime formule is soup with salad, carrot cake and a hot drink for 10 euros. A bargain. 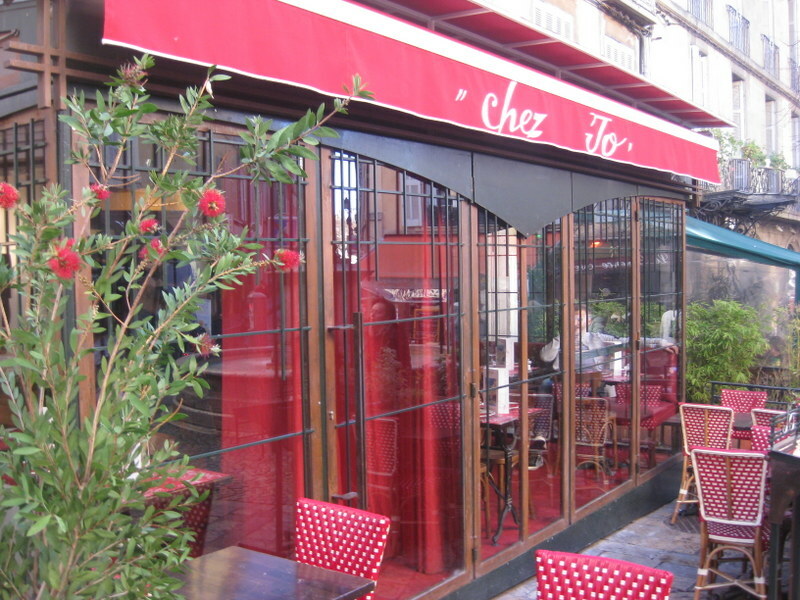 It is however a tiny restaurant….great news then that they have just expanded to another café in the Quartier Mazarin (see next item). Open Tues-Fri 8-18, Sat 9-18, Sun 10-17:00. 12 rue des Bernadines, Aix. Good for: fruit and veg market views and people watching! It was a surprise when ‘Happy Days’, the café in the corner of Place Richelme was demolished before Christmas; it always seemed busy. 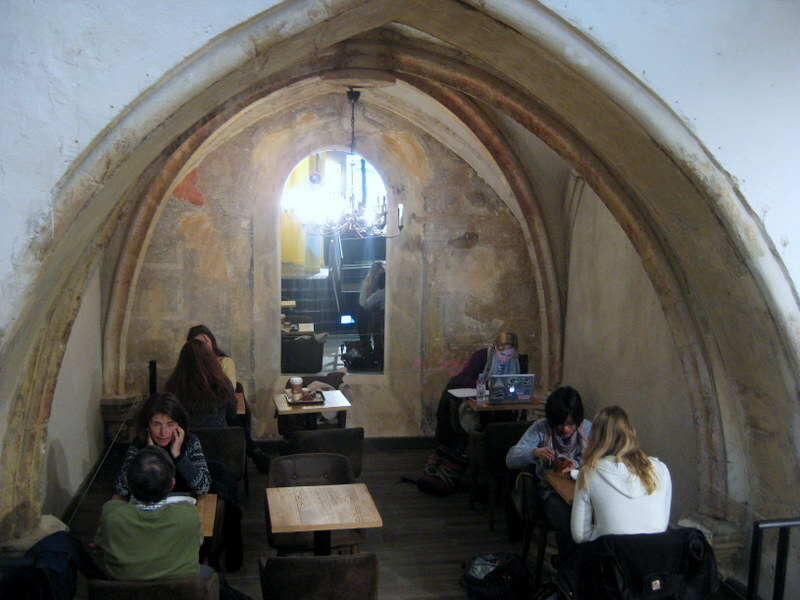 But now Le Petit Bistrot is in its place and it is a delightful place to have a petit dej’, coffee or hot chocolate. Wide choice of wines, beers and cocktails too. This was the view on rainy Thursday with people scurrying round the fruit and vegetable market under their umbrellas. We really felt like we were sitting in a film set! Lunch brings a choice of classic French dishes: this weekend, the plat du jour was Onglet de boeuf, sauce au cepes, 12€, suggestion du jour Souris d’agneau, 19€, or plat du jour + café gourmande, 17€. In fact there is also an established ‘Le Petit Bistrot’ in the place Augustins, and another, fairly recent, at the top left of the cours Mirabeau; they are locally owned and share branding and menus. This one in the market place though has a wonderful outlook and is great for people-watching. We have been there several times for breakfast though and they do seem to have a habit of running out of croissants and/or baguettes. Fortunately there is a bakery right next door and they are very happy for you to buy something there and eat it with your coffee. The address is 1 rue Méjean, referring to the road running up the side of the café. 09 51 75 10 76. Facebook: lepetitbistrotaix. Open non-stop, 7:00 – 2:00hrs. Cuisine 11:30 – 23:30hrs. This restaurant is currently riding high on Tripadvisor despite the fact that it only recently opened. That is quite an achievement and so I had to investigate. But I had an added incentive when I realised that it was in the former premises of ‘Thé a Theme’ which was a very popular lunch-spot and much missed when it closed. It’s a special little resto in that it is hidden from view, tucked away down a quiet passage and a lovely surprise when you discover the ancient dining room and shady leafy garden. The new proprietors have smartened it all up but its essential charm remains. 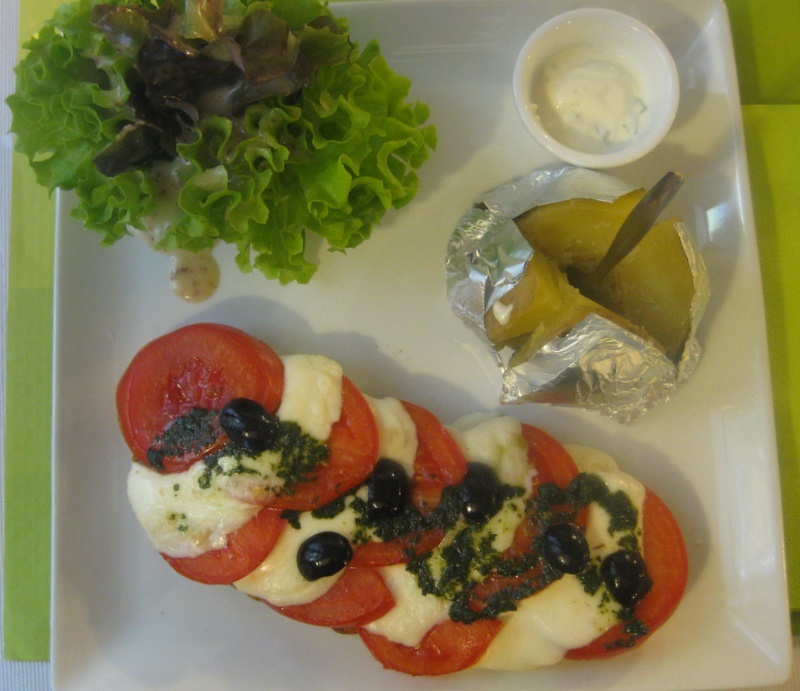 They offer a range of tartines which come with salad and jacket potatoes, tarte of the day, and salads, all 11-15€. After that you can choose from a range of desserts – lemon meringue, tiramisu, chocolat moelleux – or have a café gourmand which is a little espresso with various tiny desserts on the plate. I had an excellent tartine of Brie, honey and hazelnuts, a great combination and here is M. Aixcentric’s Tartine Italienne. They were presented beautifully – I was impressed by the lettuce leaves bundled together with a cucumber strip to make a little tree on the plate! There is no Amalula by the way. It’s an amalgamation of the friendly hostess’s 3 daughters: Amandine, Lucille and Laurine who is in the kitchen. It’s open 8:30 (for breakfasts) – 18:30; Mon-Sat. At 7 Rue Mignet, Aix. Details: http://www.amalula.fr/ or check out Tripadvisor. Lunch today at a restaurant where I just wanted to run away with all the lamps! 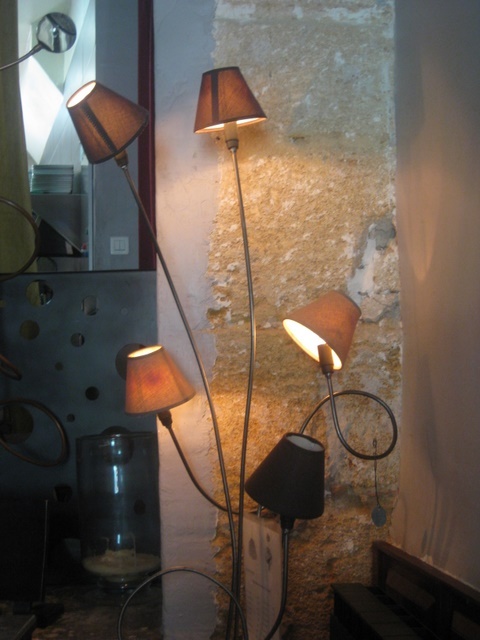 They are all different, really unusual and perfect for the arty/funky ambiance at Drole d’Endroit. The big wooden beams across the ceiling seem to marry well with the modern steel girders,and the room is decorated with large black and white photos, flowers and pops of colour in the form of pretty vases on the tables. 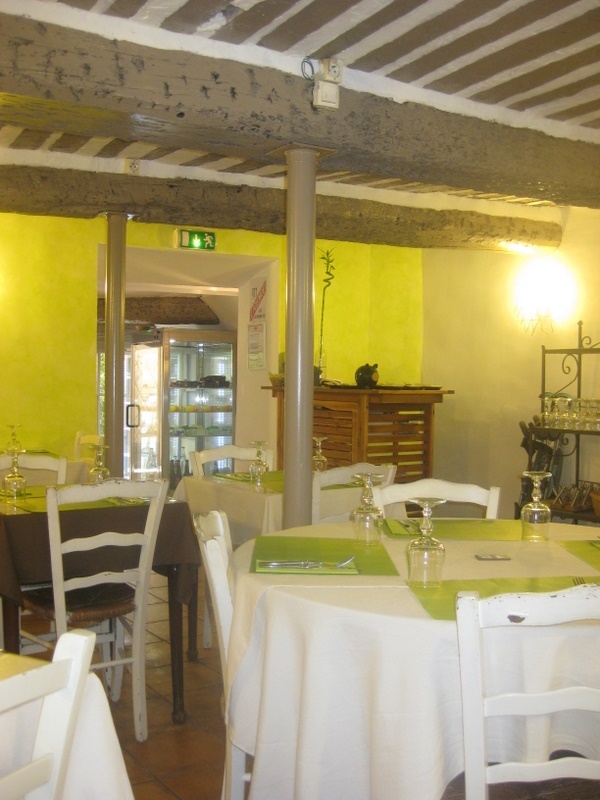 The restaurant is truly ‘tucked away’ – it’s in a tiny alleyway off rue Bédarrides but it is obviously well-liked as it fills up quickly at lunchtime and reservations are needed for evening dining. There is the obligatory blackboard with chalked suggestions for entrées, plats and desserts. Main courses are 13,2o€ – my vegetarian plate of stuffed tomato, tasty lentil salad, cream of courgette soup and red peppers marinated in olive oil was excellent and filling. Lots of choice of fish and meat dishes. Puds included tiramisu, panna cotta and cheesecake, all 6€. Restaurant Drôle d’Endroit, Tues- Sat, midday and evening, closed Wed lunchtime. Tel : 04 42 38 95 54 ; 14 rue Annonerie Vieille. Day 3 of the New Year regime and we were in search of a light lunch. These are getting much easier to come by now in Aix but I happened across a new restaurant advertising itself as a saladerie and tarterie. Just the job! La Table des Saisons which had only opened 3 weeks previously has as chef Lionel Durbino, an experienced patissier, with his English-speaking companion Martina in front of house. The tartes looked good – what regime? – but the tarte fine aux echalottes was, Martina explained, not up to their usual standard so advised a salad. 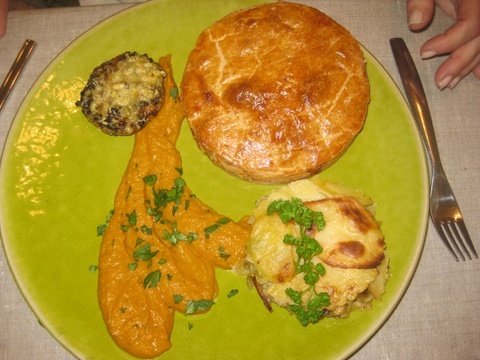 My dining companion did have a meat-based tarte which came with a stuffed champignon de Paris , puree of carrots and coriander and a gratin de pommes de terre et poireaux. These main courses at 10-12€ are very good value. There are various patisseries for dessert. If you aren’t aspiring to losing kilos, you can opt for the plat-dessert-coffee deal for 15€, or plat-dessert-wine for 16€. During the afternoon, the home-made patisseries are for sale with different teas. This small restaurant is spotlessly clean, sleekly modern and has a little table with colouring kit for junior diners. After I had finished my salad, the chef came over to explain that he had been experimenting with his tartes fines aux echalottes but that they were not yet to his satisfaction. They are changing the menu regularly and seem committed to quality cuisine. I wish them well. 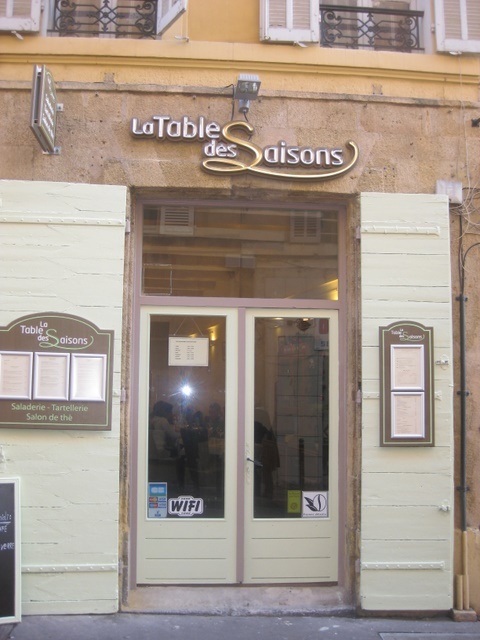 It’s a while since we have visited La Table des Saisons so were happy on a recent visit to find the same standards of quality that this young couple have insisted on from week one back in December 2013. The chef is Lionel who has 20 years’ experience as a patissier, both in France and abroad, and he makes all the plats and desserts in-house. His partner Martina welcomes their customers and is happy to explain how the dishes are made – in English and Slovak as well as French. We had a delightful lunch, unhurried, calm atmosphere and unobtrusive service, ideal for a catch-up with friends. The menu of course changes with the seasons – have a look at their website -https://latabledessaisons.com/ – they have special dishes of the week, alongside a variety of savoury tartes and salads. Desserts are Lionel’s speciality and I had an unforgettable ‘Delice poire, pain d’épices’ (pictured). Open: Daily, except Wednesday, for lunch and as a salon de thé during the afternoon. They also open for dinner on Thursday, Friday and Saturday evenings. 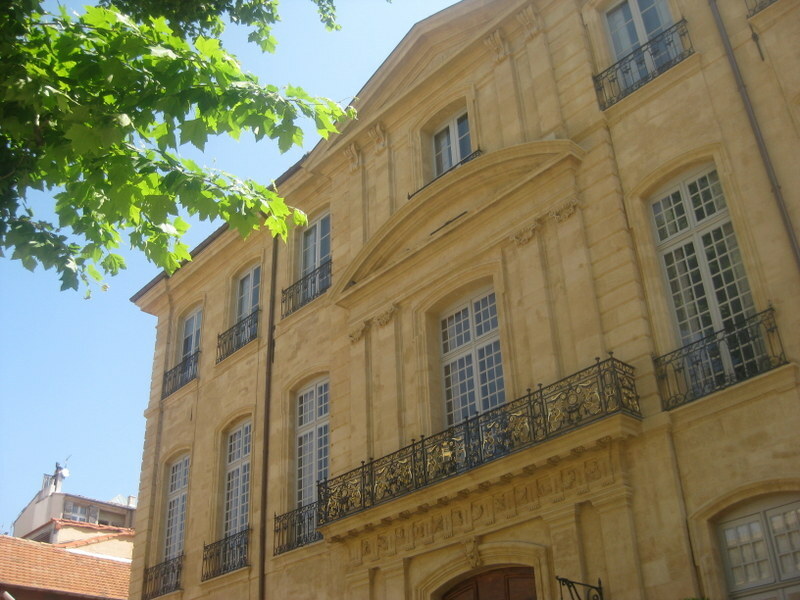 Address: 6 rue Lieutaud, Aix. 04 42 22 97 07. Traiteur service: one can order savoury and sweet tarts, salads and a range of aperitifs to wow your guests at home, with 48 hours’ notice. The title of this tiny resto perfectly sums up its offer. 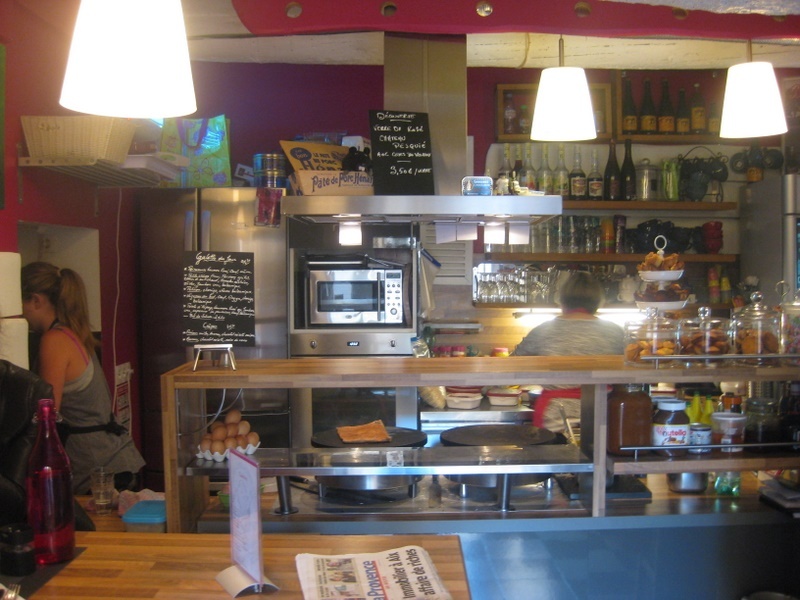 Breton Delphine has two hot-plates from which she produces a never-ending stream of savoury galettes and sweet crepes. It’s a very relaxed and friendly place to have lunch but I would recommend reserving a table as it is so small – two tables by the counter and another four in the cosy basement. I tried the galette forestiere, a whole-flour pancake with wild mushrooms, goats cheese and cream. It was delicious but incredibly filling – so I will have to assume the crepes for dessert are equally good. 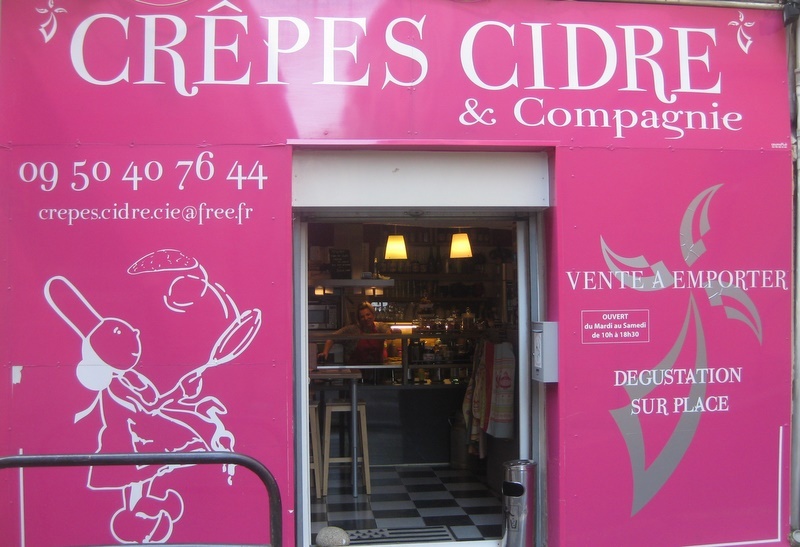 Crepes Cidre & Compagnie is open Tuesday to Saturday 10-18:30. 23 rue de La Cepede. Phone 09 50 40 76 44 to reserve a table. Good for: a light lunch or snack in spacious premises, and thus somewhere to sit! Cours Sextius. It’s been nicely renovated (it used to be a bar) with huge windows, trendy industrial lighting, stripped-back brick walls, beams, pretty furniture…….and newspapers and magazines lying around just waiting to be read. According to the dictionary, a bidule is a what’s-it or a thingummy or a whatjacallit, which is an odd name for a Provencal brasserie. It’s situated right down at the bottom of the place des Cardeurs and we tried it for lunch last week. And a reasonable lunch we had. The salad was an average salad, la belle-fille Aixcentric was happy with her burger and (home-made) frites, and le petit-fils Aixcentric enjoyed his child’s special of steak haché and frites. The menu was basically salads and burgers with some specials, plus the usual desserts. It doesn’t really distinguish itself from other places – no USP in marketing terms – and maybe that’s why it’s called itself after a what’s-it? your water on if you are a three-year-old) and the bunting and strings of lights. It must look pretty at night. I would say ideal for a young family or teenagers. Le Bidule, 1 place des Cardeurs. Open 7/7, 9:00-02:00hrs. We happened upon La Familia by chance just before Christmas and were struck by the warmth of the welcome and the welcome warmth from the feu de bois oven as we went into the restaurant. That’s what you need on a chilly damp November day! The menu is on a blackboard and has a wide range of pizzas (they looked good), fresh pastas and salads. We opted for the tatin des legumes which was delicious and at 10€, good value. I think this is what the French call ‘une tres bonne addresse’ because shortly after midday, the restaurant was pretty full. You can find it at 20 rue Boulegon (04 42 23 51 58). It’s open daily, lunch time and evening, except Sundays and Monday lunchtimes. Here’s a warm recommendation for cold days. I’ve been wanting to try La Table Marocaine for a while now and this week enjoyed a good lunch with a fellow blogger. 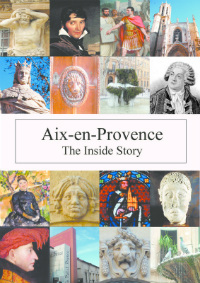 Have a look at www.sociologicalobserver.com for Anne’s comments on life in Aix. They have a website www.latablemarocaine.com which gives their menus. The tagines and couscous we tried were excellent and we followed with patisseries orientales and thé a la menthe. I would suggest getting there soon after 12 though as it is a small resto and filled up really quickly. Always a good sign! Details: La Table Marocaine at 10 rue Constantin. 04 42 96 05 54, open everyday lunch-times and evenings. Good for: Quiches and salads. Tiny. Another chapter in Aixcentric’s quest for finding out-of-the-way eateries in back streets, run by people who do the cooking and deserve lots of support…though in this case they seem to have plenty! Le Brunch a good little café for lunch-times. It’s tucked away off the Place des Precheurs on rue Portalis and it’s tiny. It’s also very popular so be prepared to wait a little for a table and even longer for service. When we visited, students were queueing for take-outs and no wonder – everything is home-cooked, tasty and very reasonably priced. The display in the window (above) was starting to get depleted even though it was before mid-day. Stocks do get replenished. 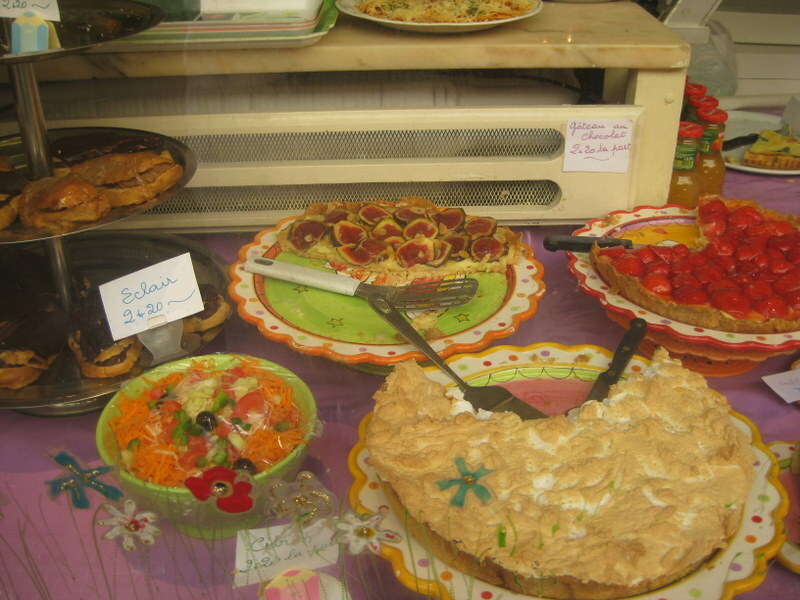 There are quiches for meat-eaters and vegetarians, at 2.20€ and large salads – I’d advise one between two sharing. The puddings look great but we didn’t get that far. I puzzled as to why this place is called Brunch when it doesn’t serve brunch, but I now learn that the family are called Brun. Hmmmm…. But well done the two ladies cooking and waitressing and coping with so many people. Recommended. It’s hard judging a restaurant from the outside. Some look tiny and are tiny….others are deceptive. And the new ‘Marasino’ is one such. The small terrace, next to the Hotel St Christophe near the Rotonde, gives no clue as to the large number of seats inside. It’s a cross between an Italian restaurant and a deli, and has been decorated very stylishly indeed. There are nooks for having an apero (see above) or for playing the piano, or for choosing some Italian delicacies or wines to take home. 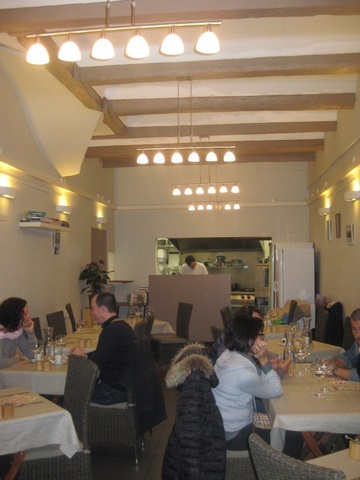 The menu offers panini, tramezzini, focaccia, plates of charcuterie, cassolettes, salads and pastas as well as desserts. It’s downloadable at http://www.marasino.fr. We had a snack there after a French class and all opted for panini, so didn’t really put the options to the test. But the service was friendly and I did like the very Italian vibe. Details: 2 bis Ave Victor Hugo. Tuesday-Saturday 9-22:00. Reservations on 04 4 200 200. This is just a few paces from the Rotonde (ave Victor Hugo) and offers lots of alternatives for a light lunch, dans l’esprit slow food. Here’s how it works. You take a printed menu sheet, write on your name, tick your choices and pay the genial proprietaire at the till. Your lunch is made to order from fresh ingredients and your name is called for you to claim it. They have 50 variations of petits pains chauds (1,90€ each) – pictured my choice of artichoke, piperade and Parmesan, plus melon, mozzarella and rocket – which can be accompanied by a simple salad or crisps at 1€ extra. Or you can have the ‘formule papilles’ for 9,80 – 3 sandwiches, dessert and drink – or one of the 7 salad plates on offer. As the menu says, it’s a case of ‘Choisissez, Cochez, Commandez’. It gets the thumbs up from Aixcentric because it’s central, provides a fresh, light lunch, and has bags of seating both inside and out. Details and menus on www.laurane.fr. I think your taste-buds will be happy! 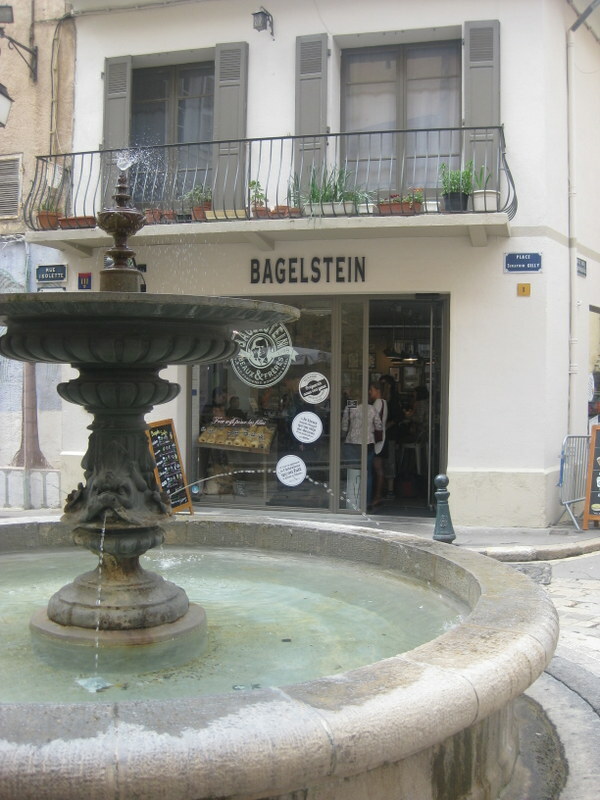 Bagelstein, another popular place for a snack is a different proposition in that it is a franchise operation with outlets all over France. It has jokey posters and sayings and ‘infidelity’ cards around the place, just as though it is run by a quirky person, but of course it is all part of its corporate offer. As you would expect they offer lots of different types of bagels and lots of different fillings. You go along a counter with plastic-gloved personnel customising your lunch. Their menus are on the chalk-board or you can see beforehand on http://www.bagelstein.com. Mine was very tasty and good value for money. 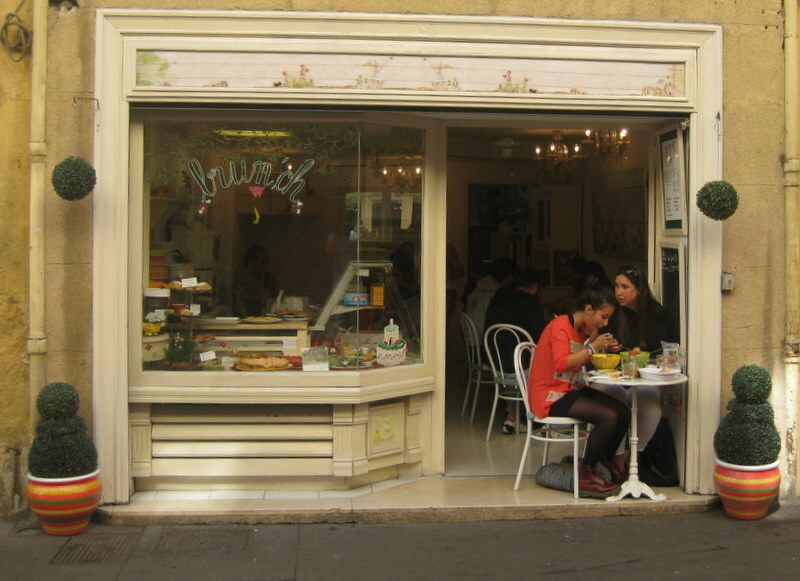 Like Maison Nosh, the clientele are young, studenty and spill out around the nearby fountain. I visited the branch at 11 rue Isolette, near place des Tanneurs. Open 10-22 Mon-Sat, 10:30-17, Sunday. I think both are fine options when you just want to sit down, have a rest and a hearty snack to see you through the afternoon. Columbus Café – a place with a surprise! La Fromagerie in the passage Agard which opened a couple of months ago is nothing if not stylish. I called in there recently and was dazzled by decor and the variety of cheeses on offer but I had one choice in mind: Cheddar. I know I shouldn’t be buying English cheese in France but it really is the only possible ingredient for Cauliflower Cheese in the Aixcentric household. Now, 0.27kg of cheddar for 8.70€ did strike me as being rather excessive but it was strong and very tasty in my dish. And I was interested to find out what lunch there is like. 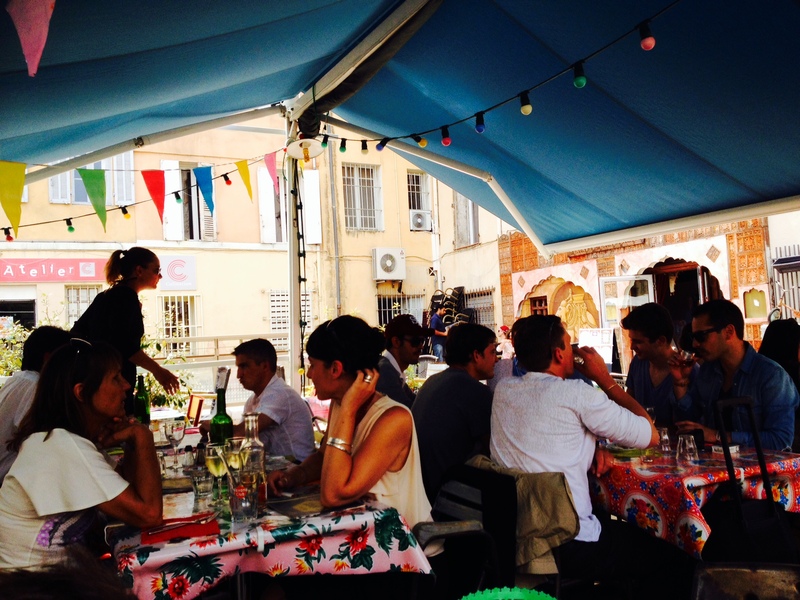 Diners can choose from a small dining room on the 1st floor or climb further up to the roof-top terrace which has parasols and heaters, both required in this exposed spot among the roof-tops of Aix. The lunch menu has a fairly good choice. My companions opted for Tataki de Thon, fromage blanc au Thé Matcha (19€) and Hamburger de Boeuf a la Fumainson de Brebis (17€) and I got the one vegetarian option which was Penne Rigate au Gorgonzola Cremificato with Poire rôti aux noix (15€). Clearly the theme is cheese in everything! But mine was delicious, especially the roasted pear in the middle which I am going to try and recreate chez moi. The desserts were all cheese-based too – we shared a cheese-cake with sorbet pêche – which was OK but a little claggy. Verdict? Delicious main courses all round, very cool atmosphere (great for taking visitors), slow service (not always a bad thing), reasonable prices……….but next time I’ll get my Cheddar in Carrefour. Good for: Vegetarians. Tiny – Some tables outside. This is Aix’s only bio, vegetarian restaurant. 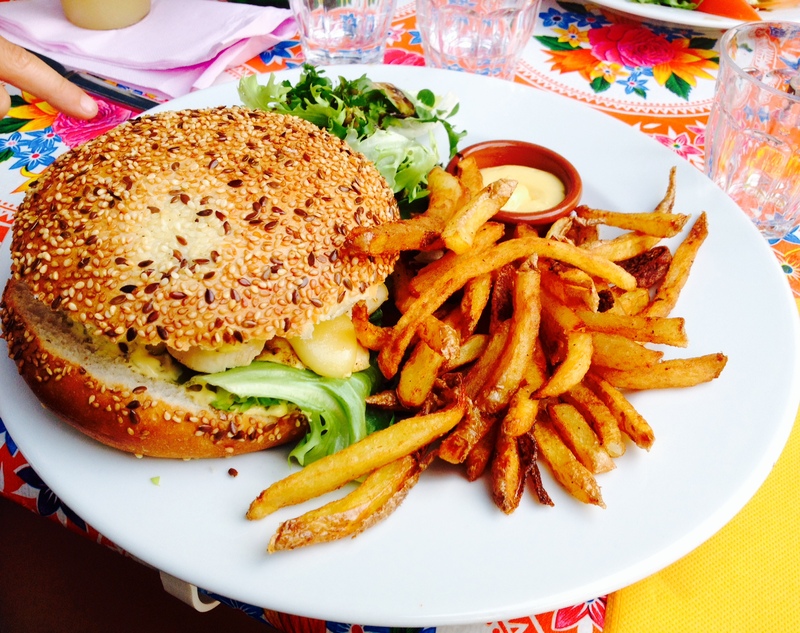 Owner Stéphanie explained to us that there is another vegetarian restaurant (La Cantine Végéterienne) and several bio restos – but hers is the only one that is both. Salad of radis noir, red cabbage, cucumber topped with germinated seeds. Her menu says it all: ‘Pas de micro-onde ici – juste 2 petits bras qui s’agitent avec bonne volunté’. And it is literally two arms most of the year as Stéphanie only brings in a waiter during the summer months. 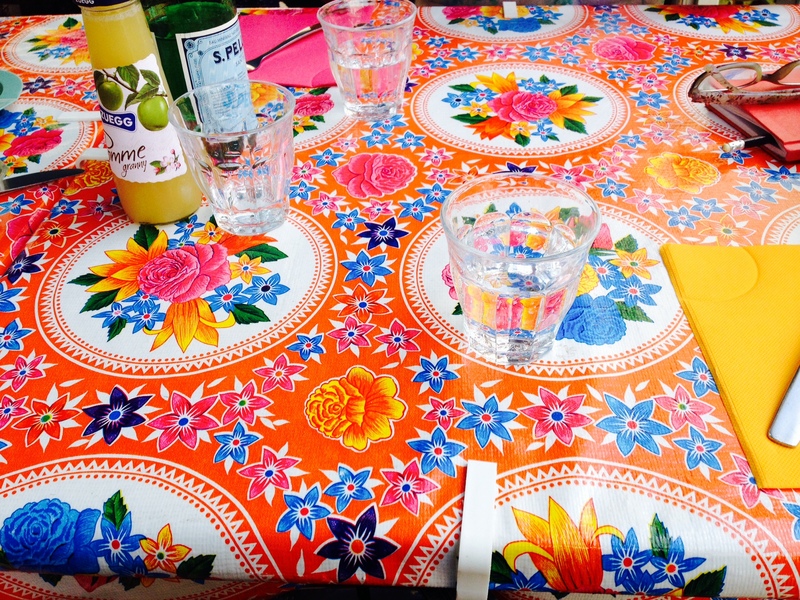 We liked the ambiance – mis-matched chairs, pretty waxed table cloths, wall-lights and lots of tea-pots. Best of all was the friendly atmosphere. Plats start at 12,30€, the plat degustation was 17€ with desserts – mainly home-made cookies and muffins – for a few additional euros. La Cerise sur la Gâteau is closed Sundays and Wednesdays. Open for lunches from 12-16:00hrs. Tel: 04 42 27 46 46. It is a tiny place and people were waiting patiently for our table today. Best go early. For a cosy eastern experience, why not head to Orienthé in centre ville? We dived in there one day, out of a cold late afternoon wind, and loved the warm ambiance they provide. You leave your shoes at the door and find a nice heap of cushions to sink into. The small room is illuminated by lanterns and decorated with all sorts of glittering wall-hangings. Seduced by the waft of incense and soothed by flowery-citrussy teas from silver pots, the hassles of everyday life seem far away. Well, until you have to get up off the floor which is an increasing challenge ! This is such an unusual hideaway and one of my favourite treats in Aix. 5 rue Felibre Gaut, Aix (off rue des Cordeliers). Open everyday 13:00-01:00hrs. 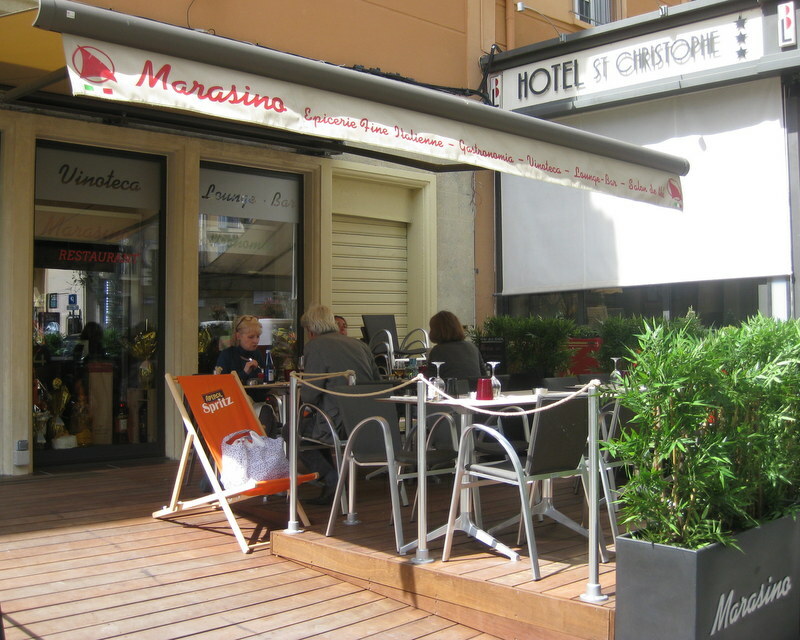 Here is a pleasant place for a light lunch in Aix, just a few paces from the cours Mirabeau. A group of us tried ‘Basilic & Citronnelle’ which is a small restaurant at 5 rue de l’Opéra. They offer a plat du jour, various quiches and also an assiette végétarienne They have home-made pâtisseries for afters and with coffee, the bill came to just under 20€ each. It’s open every day except Sunday, lunchtimes only. 04 42 27 58 77. Good for: Best pizza in town according to my French neighbours. Take-away only. There’s always a queue at Pizza Capri and that’s not surprising since they serve up slices of gooey, cheesy Italian heaven. The only downside is that until now you have had to eat it in the street; but there’s a current promotion with nearby cafes means you can eat your pizza on their premises as long as you buy a drink. So, for instance, you could just walk up the cours Mirabeau a few paces and find a seat at Le Roi Rene which has a nice terrace overlooking the statue. They will welcome you (and your slice) from 15:00-18:30 and after 22:00hrs. Other partner terraces include Chez Mus (opp Town Hall), Happy Days in Richeleme Square and the Sextius Bar, though I would have thought it would have cooled off by the time you got to cours Sextius. You can find details of all 9 participating cafes, and the hours they have specified, in a leaflet (in English!) at Pizza Capri, 1 rue Fabrot – just alongside the Deux Garcons. You can eat or have a coffee without paying to see the exhibitions. You have to go to the ticket desk at the entrance and buy a Café Pass which lasts for a year. What a wonderful experience and a big plus for Aix. Here’s a recommendation for lunch which will take you right off the beaten track and far away from tourist groups. Don’t read on if you are looking for fine dining and sophistication. Chez-le-Garde won’t offer you that. But for me, it was a truly Provencal experience: we were surrounded by French families, welcomed by friendly staff and a warm fire plus there was a superb view of the Sainte-Victoire. A winning combination. Until 1953, the building was home to the local gard-chasse, the gamekeeper, who got a reputation for his patés and game. Slowly it became a restaurant and with its success, bits were added – conservatory, lean-to extensions, a terrace. A delightful muddle with absolutely no pretensions to style. We had lunch one Sunday at the end of January and felt so happy to be in such an environment. Pizzas figure largely on the menu – I had the Pizza du Garde which is their speciality (Sauce tomate, emmental, mesclun, chèvre, camembert, bleu, tomates séchées, olives) and it was delicious. But there are other dishes to try from the blackboard (gnocchi au gorgonzola, entrecote marseillaise, etc) and a good range of desserts. The table wine, both red and white, was excellent – it came from the vineyard Fredavelle at Eguilles. What with the roaring fire and the pizza oven, it was a very cosy experience; but we plan to go back in warmer weather to enjoy the terrace and its views of the Sainte-Victoire – and to take advantage of the boulodrome. Open in winter Wed-Sun, lunch and evening. Reservations necessary. Address: 342 RD10, 13126 Vauvenargues. Speciality restaurants abound in Aix so it’s not surprising to learn that you can do a Tour de France in centre ville, sampling all sorts of regional cuisines. O Panier Normand which opened recently in rue Cordeliers is run by a couple from Gouttiere in Normandy – a place-name which gives rise to local jokes as it rains so much. You can eat in – they have meals based on regional dishes – or you can stock up on camemberts, calvados, jams, cider and rillettes de foie gras. 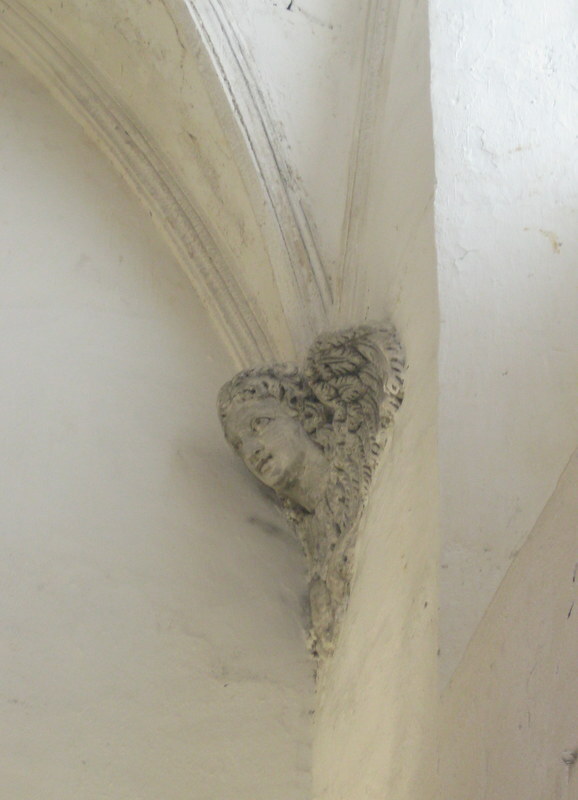 20 rue des Cordeliers. Moving on to the Basque country, two young men from that region have taken over the K Val restaurant which is now decked out in the traditional colours while the owners are often to be seen in Basque berets or the foulards bayonnais. Fish-lovers can try the seche facon Saint-Jean-de-Luz farcie au jambon de Bayonne, while to drink there is Irouleguy AOC from Basse-Navarre. Finish with Basque cakes with shots of Izarra, a local liqueur. La K Val des Basques, 2 place Joachim Gasquet. Alsace is represented in town too. The restaurant Alsace en Provence offers sauerkraut marinated in Edelzwicker which is a wine made from 3 varieties of grapes. They also serve baeckeoffe aux trois viandes sur lit de patates or Spatzeles, fresh pasta fried with eggs and accompanied by Riesling or Sylvaner, both AOCs of the region. They also sell food to take away including their blueberry jam or Meteor beer. 3 rue Jacques-de-la-Roque. Next to Savoie where fondues feature on the menu. Beaufort, emmenthal, comté and raclette cheeses are brought to Aix from a co-operative in Thones in Savoie and the charcuterie too comes from the region. It’s a little like a chalet – expect an atmosphere ‘rustique chic’. La Luge, rue Felibre Gaut. Crepes Cidre & Compagnie specialises of course in Breton cooking. It was started in 2010 by a lady from Finistere who wanted to emulate Breton hospitality and savoir-faire. Working alone, she makes all sorts of crepes, using flour from the last water-driven mill in Pont-l’Abbé. Lots of cider – or you can try her whisky or eau-de-vie breton. You can order crepes by the dozen if you are having a party. 23 rue de la Cépéde. Corsican products are on sale at Stella Corsu. You can find fromage de brebis and chevre Sisti, charcuterie (coppa, lonzu), paté de sanglier, de figatelli……….plus honey and Corsican oils and wines. On Tuesdays and Saturdays, the young owner has products like he used to sell on the market at Ajaccio – chausson aux oignions, aux blettes et brocciu for instance. Each day he has a different dish, using seasonal products. 7 rue Portalis. Overseas now to try cuisine Créole. La Case Créole has specialities from the Caribbean, la Reunion and Madagascar. The owner, herself from Madagascar, says that her dishes reflect the cross-cultural influences of these countries. There is Asiatic ravioli stuffed with pork or shrimps, samosas, spciy specialities from Guadaloupe and Martinique or rougail saucisse, the traditional dish in La Reunion. Rue Aumone-Vieille. And finally – Le Comté d’Aix. This restaurant has been serving Provencal food now for 30 years but the current chef has been there for just three. He is from Les Milles and trained at the lycée hotelier at Sisteron – so he knows his local ingredients. He is committed to serving fresh products – meat flambéd in pastis or fish of the day with a pistou crumble. And to finish – what else but une mousse de calisson? That sounds good! 17 rue de la Couronne. Pizza Capri has the right idea and so do the neighbouring restaurants! I did a stint working as a waitress in a Greek restaurant and to make the place look busy the chef & waitresses sat with drinks at the tables in the early evening! I hadn’t really thought of that – clever!! Not sure how Aix or Marseille fare, but the stars are out and I don’t mean the Oscars, thought you might be interested. Excellent info ….thanks very much! The Brun family own Le Brun’ch! Aha! That now makes sense …thanks! 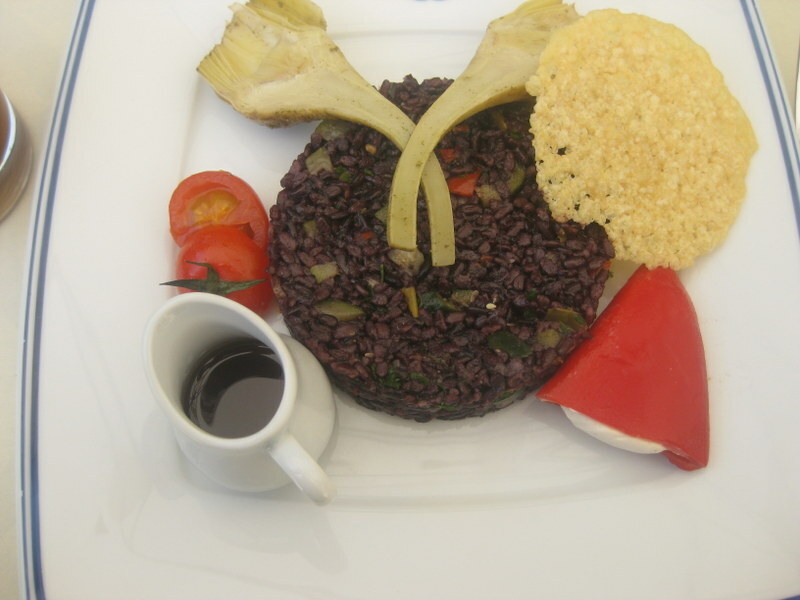 I am a vegetarian living in Aix and really appreciate all the restaurant recommendations! on September 11, 2013 at 6:49 pm | Reply barb Cerny- just moved to eguilles from Toronto. you must go to Eguilles salon de the for lunch. A lovely spot with a fantastic lunch and a small space for exhibitions in the back. Very charming and excellent food. Acros from lovely cremerie just reopened. What a good idea. I will investigate, hopefully before I head off back to Angleterre! What a nice rundown of the local spots! Thanks so much for this. I’m a fan of le Bidule, we’ve had lunch there a few times. The best thing in my opinion is the fish and chips; superb! Really great quality fish, the batter was perfect and the chips are home made as you mentioned. I love the kitsch decor and cool vibe. Unfortunately fish and chips is off limits for me at the moment as I have a few kilos to lose but last time I ate there I had a salad – it was pretty good too, better than average in Aix. Thanks for all these reviews. 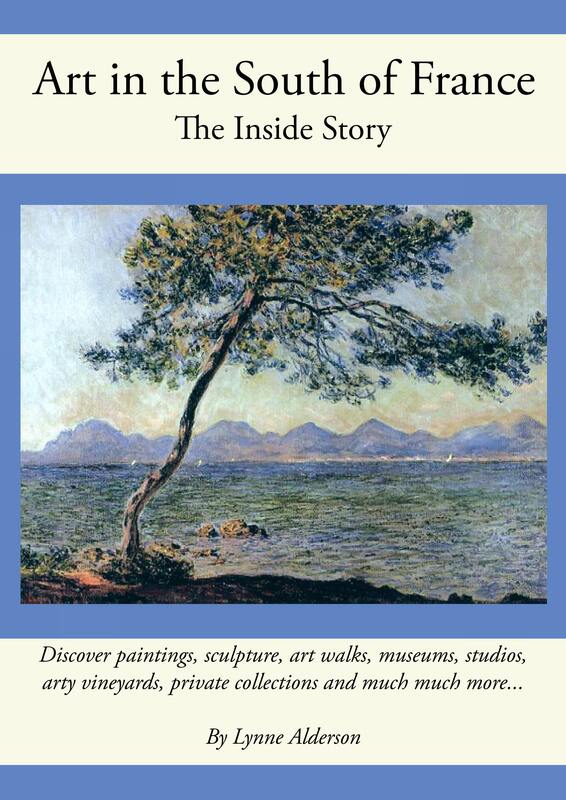 Thank you – coming to Aix in June from Australia – this is a terrif guide to finding nice places to eat. That’s a lovely time to be in Aix. All the restos mentioned have been personally tested (!) and I hope you enjoy them. I’m vegetarian so tend to go for more casual places……but there are heaps of places to try if you want to go to somewhere more formal. Have fun!